The End of Days (not the arnold schwarzenegger movie) or the End Times are associated with the end of the world. The end of the "age" is often depicted as a time of tribulation that precedes the appearance or the return of the Messiah; this one figure will usher in the new age or the kingdom of God in order to bring an end of the evil and suffering.These concepts can be found in most major religions around the world, and also in the mythology of many ancient cultures. It's interesting to consider the similarities between some of the end time scenarios of different religions/cultures. In Judaism, the phrase "End of Days" appears several times in the Tanakh, which is the Jewish Holy Scriptures. In Jewish though, the return of the messiah is not necessarily a pre-determined event but rather it is an event that is brought about by faithful religious observance and good deeds. In traditional Judaism there is a firm belief in an afterlife but the primary focus is on life in the here and the now; but there is a belief that the Resurrection of the dead while be a sign of the end times. In Orthodox Judaism there can be several diverse beliefs about death and the afterlife; from the righteous awaiting the messiah or ascending to heaven, or even reincarnation of the soul and also self created "hells" where the wicked are tormented. Events described in the scriptures of the old testament describe the creation of a new order in which God is universally recognized as the ruler over all of His creation. In the end times, the Jewish Messiah will become the one anointed King of Israel. He will divide the Jews in the land into their original tribes. During this time, Gog, king of Magog, will attack Israel. Magog will fight a great battle but God will intervene, fight the final battle with His enemy, and the Jews will be saved; all evil will be banished from human existence and an era of worldwide peace will be brought forth; all people will know God directly. This age of tranquility and spirituality is called the Olam Haba ("Future World") and according to the Jewish calendar will not occur until the seventh millennium (after the year 6000). Rabbi Moses ben Nachman Views on death, mourning and the resurrection, Commentary on the Torah, and more. The Talmud is a central text of mainstream Judaism. One part of this text states that the current world as we know it will only exist for about six thousand years. The Hebrew calendar begins at the creation of the primordial man, Adam. Ancient Jewish teachings consider these years to be literal, consistent throughout time, and not symbolic; there are 24 hours per day and an average of 365 days per year; leap years are considered according to the lunar and solar cycles. According to the present day Jewish Calendar the year 2009 equals 5769 years since the creation of man. According to this calculation, the end of days will occur on or before the year 2240 (the year 6000 in the Hebrew calendar). The Book of Revelation, (Revelation to John /Apocalypse of John / Revelation of Jesus Christ) is the last canonical book of the New Testament in the Christian Bible which mainly describes the apolcalyptic and end times scenario through the visions of the author(s). In Christianity, the Second Coming refers to the return of the Messiah Jesus from heaven to the earth, according to the prophecy, the dead will be resurrected and the Final Judgment will take place at this time; the kingdom of God will be established here on earth ( the Messianic age/era and the Reign of God). In Christian thought, there are several different veiws of the end of days scenarios. The Christian Holy Bible makes several references to these end times; The second coming or return of Jesus Christ/The Saviour is referred to as: "the day of the Lord", "the day of Christ", "the day of the Son of Man", "the last day", "the Epiphany", "the Appearance"... The actual phrase "Second Coming" or "Second Advent" is not directly used in the Bible; but the life or incarnation of Jesus of Nazareth may be considered his "first" coming" to earth. The Coming Antichrist: Jesus of Nazareth? A Tragic Case of Mistaken Identity? The Bible offers several examples of Jesus referring to himself as the Son of Man; or describing the role of the Son of Man who is to come in "glory" or in "his kingdom"; Jesus foretells of his own impending execution, and the persecution of his disciples. In Daniel 7:13-14 a dream reveals a vision of the "one like the Son of Man" or a human being who "came with the clouds of heaven", and came to the "Ancient of days" or the "Ancient One" and was presented before him;to him was given dominion and glory and kingship, that all peoples, nations, and languages should serve him. In the Kabbalah, "Ein Sof" (or Ayn Sof) is describing "Infinite Divinity" and means "unending", "no end". Ein Sofis is the Divine Origin of all created existence; the Ancient of All Ancients. The Ancient of Days is the manifestation of the Ancient of Ancients in space and time. The Rapture The Rapture refers to the end times event when all true believers/followers of Jesus Christ who are still alive will be transformed into their spiritual bodies , taken from the Earth by God and brought into Heaven; The non-believers will be left behind during the tribulation period as the Antichrist prepares to take his place as the Beast. The tribulation period will last for about seven years, the final seven years of this age. The, the final seven years of this age, until Christ returns to set up his earthly kingdom. The term "rapture" is not found in the Bible and the theory is firmly based on Scripture. There are other variations of the Rapture in which Christians will remain on the Earth as witnesses during the seven year tribulation period, (until the end of this age); believers will either be removed or protected from the wrath of God that is predicted to occur toward the end of the seven years Another view holds that Christians will be taken from the Earth to be in Heaven with God at some point during the middle of the seven year period of tribulation. A Brief History of the Rapture. 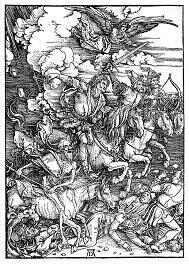 The Book of Revelation also refers to the apocalyptic battle of Armageddon; Armageddon refers to the site of the final battle/campaign between God and Satan (the adversary or the Devil). Satan will operate through a person who is the "Beast" or the Antichrist. apocalyptic catastrophe. In Catholicism there is a somewhat literal interpretation of the Bible in regards to the end times; some Catholics believe that Jesus foretold of signs which would indicate that the "end of days" was near. Some of these signs include earthquakes, natural disasters, civil problems, 'wars and rumors of wars', and other catastrophes; the end of days will come like a "thief in the night." End-times beliefs in Protestant Christianity vary widely. There is a belief that the End Times are occurring now; Israel, the European Union, or the United Nations play a major role which is foretold in scriptures. In general, The End times can refer to the passing of a particular age or long period in the relationship between God and man. Adherents to this view sometimes cite St. Paul's second letter to Timothy, and draw analogies to the late 20th/early 21st centuries. The Church of Jesus Christ of Latter-day Saints, also known as the Mormons, teaches that humanity is now living in the last days. Some believe that the earth will only exist for 7000 years and at present we are in or around the 6000th year; they believe their will be signs to watch for to indicate the approaching of the end of days, i.e., wars, economic despair, natural disasters such as earthquakes. The end times will most likely around or after the 7000th year; Christ will return and usher in the new millennium/kingdom, considered to be earth's sabbath day of rest. The seven seals and seven trumpets of the Book of Revelation relate to the seven Millenniums of the earth. During the Millennium, every man and woman who has ever lived on the Earth will be resurrected. The Righteous will be resurrected in the beginning, and they will have the ability to return to Earth to restore historical knowledge; the wicked will be resurrected at the end of the Millennium. At the time of each individual person's resurrection, their Last Judgment will occur. Each individual will be placed into one of three heavenly kingdoms/various levels of glory in symbolic comparison to the sun, the moon, and the stars: the Celestial Kingdom (the sun), the Terrestrial Kingdom(the moon), or Telestial Kingdom. A small group of people who reject Jesus Christ after receiving the knowledge of his divinity, will go to "the Outer darkness" where the soon defeated Satan and hishost of angels will also go. Jehovah's Witnesses have similar beliefs concerning the end times and the Second Coming of Jesus Christ. Witnesses believe that the last days began in 1914 (start of World War I ) when Jehovah God installed Jesus as the King of God's Kingdom; his first action is described in the book of Revelation when Jesus cleanses heaven and casts Satan and his Demons to the earth. Since that time conditions on earth have deteriorated, leading to wars, pestilence and earthquakes. In the future, Witnesses believe that God will cleanse the earth of all evil and Satan will be bound for a period of 1,000 years; those resurrected to life on earth will learn about Jehovah (God) and live under the rule of Jesus Christ. Christ will reign over the Earth with 144,000 co-rulers and restore earth to its former paradise-like state where there will be no sickness, pain, or wickedness. Jehovah's Witnesses usually do not associate the 'end of the world', with the destruction of humanity and the planet, or use the term often; instead they prefer to use the expression: 'conclusion of a system of things', or conclusion of an age. In the religion of Islam there are clear guidelines that outline the end of times. As many as 100 various "signs" will be given to indicate that the Judgment day (Last Judgment/final judgment of humanity.) is near. Sunnah and Quran are the holy books of Islam. These signs can be divided into two parts, minor and major. Major signs include the coming of the Antichrist (Maseeh ud-Dajjal), Imam Mahdi and then Prophet Jesus, and the blowing of the Trumpet. During the end times there will be the resurrection of the dead, the fulfillment of a divine plan for creation, and the immortality of the human soul; the righteous are rewarded with the pleasures of Jannah (Heaven), while the unrighteous are punished in Jahannam (Hell). Islamic apocalyptic literature describing the Armageddon is often known as fitna (a test. The Zoroastrian end-time belief is very ancient. Zoroastrians believe that the end of days will occur as a result of a divine devouring fire. "at the end of thy tenth hundredth winter...the sun is more unseen and more spotted; the year, month, and day are shorter; and the earth is more barren; and the crop will not yield the seed; and men ... become more deceitful and more given to vile practices. They have no gratitude." "Honorable wealth will all proceed to those of perverted faith...and a dark cloud makes the whole sky night..and it will rain more noxious creatures than winter." At the end of the final Battle between the righteous and wicked, the Final Judgment of all souls will occur with sinners being punished for 3 days and then forgiven. Things such as old age, poverty, hunger, and death itself will cease to exist and the world will be perfected; even the form of the Dharma would be forgotten.. The Zoroastrian thoughts about the end times are similar to those held by the Jewish, Christian and Islamic end time beliefs. In Buddhism it is said the teachings of its founder Siddhartha Gautama would disappear after 5,000 years time and Buddhism would no longer be practiced.. According to the Sutta Pitaka, the "ten moral courses of conduct" will disappear and people will follow the "ten amoral concepts" such as theft, violence, murder, lying, and other forms of abuse; An era that is characterized by impiety, physical weakness, sexual depravity, and societal disarray will occur at this point; this era will lead to the arrival of a new Buddha named Maitreya ; hewill renew the teachings of Buddhism and rediscover the path to Nirvana. Maitreya is believed to currently reside in the what is called Tushita heaven where he is awaiting his final rebirth in the world. Like Buddhists Hindus generally believe in a cycle of creation and destruction. The current cycle or epoch is the final phase to occur. In Hinduism there is cyclic understanding of external history and internal spirituality. One "cycle" is called a Kalpa and lasts approximately 4,320 million years. There will be a decline in the state of nature and of civilization itself between periods of "timelessness" when Brahma regenerates the world of existence/reality. Brahma is considered the Creator aspect of the mind/spirit. There are four "ages" or yugs in the process complete purity to impurity. The final cycle is referred to a Kali Yuga ( the Iron Age ) where civilization becomes spiritually degraded, human lives are shortened by violence and disease and there is a general state of decay in nature. This is the chaotic and devastating period that will occur before complete destruction, but is then followed by a Golden Age. In Hinduism there is no concept of eternal damnation of the soul or even an "end times" in general. After the Kali yuga (filled with the most evil) ends, the next yuga/epoch or age would be Satya yuga which will be a peaceful period where the righteous will live; this will be followed by Treta yuga, Dwapara yuga and then another Kali Yuga cycle. Time is cyclical and the ages will keep repeating infinitely but the extent of tolerable evil and degradation in each epoch is different and the threshold that is necessary for the manifestation of God's incarnation is different for each. Brahma Kumaris World Spiritual University (BKWSU) is a newer religious movement whose teachings are based on both mediumship and channeling. It promotes a form of meditation referred to as Raja Yoga but which differs from classical Raja Yoga as described by Patanjali. As a neo-Hindu sect, the Brahma Kumaris or "Daughters of Brahma" pre-date the New Age movement but have developed characteristics that link them to its thinking. In this religious movement, the length of Kalpa is said to be 5,000 years. The current 5th age (Confluence Age) will result in total annihilation of humanity by Nuclear weapons, civil war and natural disasters; and revelation of God. The BKWSU teaches that humanity entered the End Times around the year 1936 and the current age will end in approximately 2036. Several Native American tribes hold similar beliefs concerning the end times. The Hopi believe in what is called the "Day of Purification" which will be followed by a period of great renewal. Ancient end-time prophecy foretells that the coming of the white man would signal the end times; a strange beast "like a buffalo but with great horns that would overrun the land" would appear;the earth would be crossed by iron snakes and stone rivers; the land would be criss-crossed by a giant spider's web, and seas will turn black. The interpretation of such things could be descriptions of the railroads, electrical power lines, and so on. Therefore, we are in the end times currently since such things have come to pass. It is also prophesied that a "great dwelling place" in the heavens shall fall with a great crash; It will appear as a blue star and the earth will rock from its impact. The white men would then battle the people of other lands/nations, with those who possess wisdom of their presence. There would then be smoke in the deserts, signs that will signal that the great destruction is nearing; Many will pass away, but those who understand the prophecies shall live in the places of the Hopi people and be safe. The Pahana or "True White Brother" would then return to plant the seeds of wisdom in people's hearts, and thus usher in the dawn of the Fifth World. The Lakota believe that around the end times "darkness would descend over the tribe...the world would be out of balance. Floods, fires and earthquakes would then ensue." A "White Buffalo Calf Woman" will then purify the world, bringing back harmony and spiritual balance. White bisons have been born in 1994, in 1995 and in 2006 at a farm in Janesville, Wisconsin. Many tribal leaders thus feel that the prophecy is being fulfilled. The Ancient Mesoamerican civilization known as the Maya (and many modern Maya) believe that the universe itself has been renewed on four previous occasions prior to the current creation. The first creation was an attempt to create human life; but this attempt resulted in the creation of animals instead. The second creation produced a type of people made of "clay" and as the mythology goes, they would eventually become the various insects. The third attempt at creation produced monkeys. The fourth creation finally produced the "true humans" which is us today. Each failed attempt at creating the human being resulting in destruction; each previous creation was destroyed by a catastrophe which ended the universe at the time. The animals were nearly destroyed by a flood, and the clay people from a massive firestorm; the monkey people were attacked by each other and the animals. There are many variations of the story. The astronomical-based Mayan Calendrical will be completing its first great cycle of approximately 5,200 years on the 12 December 2012. According to Mayan belief, the ending of a "great age" or cycle, and the beginning of a new one, would symbolize the coming of a great change in the universe, on earth, or spiritually within the consciousness of humankind. In Geek mythology, the figure known as, Zeus had once overthrown the reign of his father Cronus; Zeus will in turn also be overthrown by a son. This can also be thought of as a symbolic representation of the end of the world, or the end of an age. Prometheus revealed to him that this son would be born from Zeus and Thetis, if they copulated. In order to prevent this from happening, Zeus married Thetis to Peleus, a mortal hero. This union produced Achilles, the protagonist of the Iliad and one of the greatest heroes of Greek myth.